Thought I would take a little diversion in creativity. Recently much of my work has been revolving around the Winged Ones, so this weekend I finished up working on a Wolf Totem. This recent painting is of a Wolf and Dreamcatcher, named "Dreaming Wolf". The Wolf is pack oriented and is symbolic of unity of the pack and community. They are social creatures and have a strong sense of family. Boundaries and rules are important to them, as they have a hierarchy that they abide by. (This would be a good totem for those that have difficulty setting boundaries in their lives). They teach us about having confidence in our selves and loyalty to those in our circles, of course all done with structure and balance. They are confident communicators and carry themselves with surety, remind us to stand tall within ourselves and emanate that at all times. Thank you for visiting and letting me share the meaning of the Wolf Totem with you. The changing of the Seasons affects my artwork in the obvious way by influencing my color palette, but the season itself many times will change my tone and themes. Winter is a very introspective time for me. While it's not one of my favorite seasons, I understand it's importance and accept it. I miss the rich hues of the woods and the fullness of the mountain silhouettes; the barren trees bring a sense of "rawness" and in turn I find myself much more serious and contemplative. While I know that soon spring will arrive and nature will be budding with life again, this quiet time often can make the artist side feel as if it is curled up as if in hibernation. This feeling was the inspiration to this weekend's painting, "Cocoon". The symbolism in the waves of hair are reflective of her "cocoon", encompassing the rawness of her body and soul. Each section of hair is representing either Mother Earth with the natural earthy tones and sacred spirals, Father Sky with the indigo blue star scene in the sky, or the patina blue Feather like sections symbolic of freedom and soaring. The background brings in the colors of winter's ocean. Each piece of the cocoon embraces and nourishes her through this time of reflection, until the time when she will emerge again stronger and more beautiful than before. I love to watch documentaries about animals, to learn more about how they live and survive in the world and with one another. A few months ago I came across "The Crimson Wing", a documentary about Pink Flamingos and when it was over I had such an affection for the Flamingo and a new respect for it as a totem. For the past few weeks I had the Pink Flamingo on my mind strongly. He stayed on my mind until finally I painted him yesterday. Once the last brushstroke was completed, I sat down and contemplated over his symbolism. 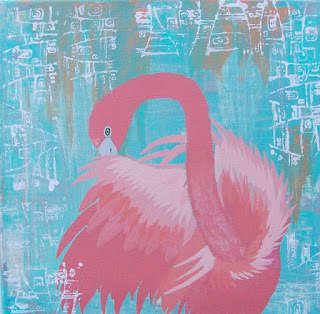 The Pink Flamingo is a part of the Heron family, who are very familiar to me. I suppose the color and it's grace are what have been enchanting me. Pink is symbolic for the Heart Chakra in Chakra Healing, representative of the heart, love, and our emotional center. He is a reminder to find balance with your emotions and urges one to contemplate the types of relationships in your life. Are you attracting healthy relationships? Are you carrying too much of the past into your present? The originating home of the Flamingo is a beautiful place, yet there are seasons when it is a challenge. This is symbolic of how our human relationships are as well.....there are seasons when things are difficult...ups and downs...yet if the love is strong, things will work out. The Flamingo is about Happiness in Love and Relationships. It reminds you to not be afraid of love, but to embrace it with open arms. In order to do that, be confident with your Self, and what your needs and desires are. The Flamingo is a beautiful totem to work with. I also created a piece of gourd jewelry that focuses on the Flamingo. I love using natural elements in my artwork, strengthening our connection with Mother Earth. The pendant is designed from gourd, painted with acrylics, and adorned with beads.